In Eq. 15-6 f is the frequency at which AvB = ACL. If ro is reduced, Eq 15-6 gives a larger CL value. Thus, an op-amp with a low output resistance can tolerate more Load Capacitance Effect than one with a higher output resistance. 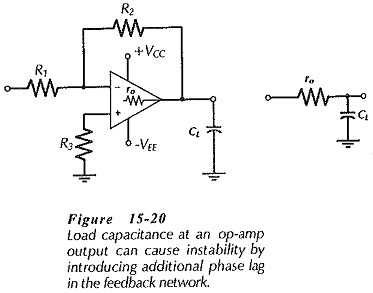 One method often used to counter instability caused by load capacitance is shown in Fig. 15-21(a). A resistor (Rx) usually ranging from 12 Ω to 400 Ω, is connected in series with the Load Capacitance Effect. The presence of Rx (with R2 connected at the op-amp output) can severely reduce the phase lag produced by ro and CL. However, Rx also has the undesirable effect of increasing the circuit output impedance to approximately the resistance of Rx. 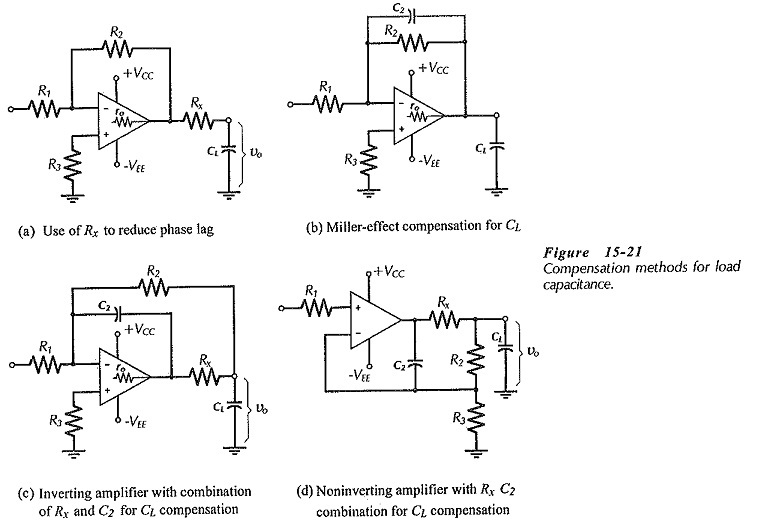 It should be noted from Equations 15-7 and 15-8 that, as for stray capacitance, smaller resistance values for R2 give larger, more convenient, compensating capacitor values.